Purse from a skirt (at whipup). SO cute, right? There aren’t many miniskirts in my closet, but there are definitely some skirts that are underworn and could find new life as a purse! Love this skirt at come and see the seitz. Even better, since it’s smocked at the top, I think it might even fit my ever-changing prego belly. 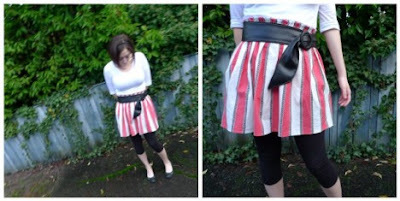 Antropologie-inspired top (tutorial by adventures in dressmaking at one pearl button). 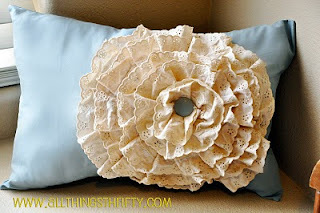 Lace flower pillow (or you could put the lace flower on something else… perhaps on a little girls dress?) 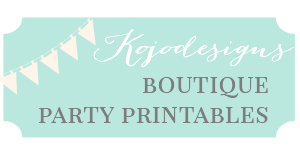 at all things thrifty. Hello, lace pillow of love!!! Why didn't I think of that?? *kicks herself* :o) Thanks for posting these! You certainly found some interesting projects. 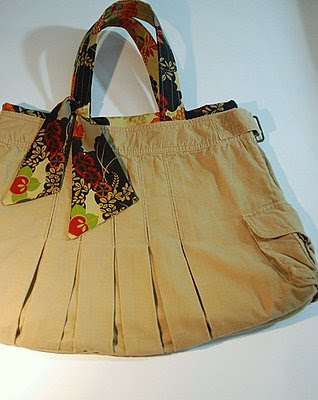 I really like the top skirt bag. Those bags are both just so great. I just discovered your blog yesterday. I can't even remember where I made the jump from Funky Junk? Anyway, I really enjoyed my visit. 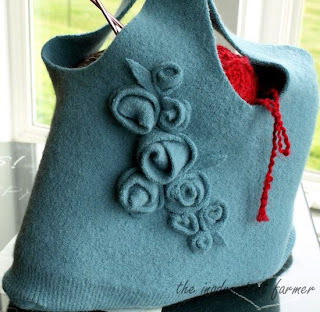 I really don't sew so I am amazed by what you can create. I do a pillow of the week feature on my blog so I will be following you and linking a pillow one of these coming weeks.